“To move or arrange in a special way”. It can also mean “movement” or “position of the limbs”. refers to a strong, dynamic, continuously flowing practice which aims to seamlessly integrate movement and breath. a.k.a, ‘Moving Meditation’: The relative quick pace of Vinyasa Flow with its emphasis on matched breath/movement and fluid transitions between poses allows many practitioners to relax habitual thought-loops and enter an embodied “flow state” of being. Same same but different? Styles of yoga at Yogalife which are synonymous with, derived from, or closely related to Vinyasa include “Ashtanga”, “Rocket”, “Sattva”, “Flow”, and the “Yang” portion of “Yin/Yang”. Our Foundation Friday series delves into the basics of yoga—looking at its postures (asana), breath (pranayama), philosophy, and all the other essentials—giving you the foundations upon which to build a solid practice. Today’s post is adapted from The Busy Person's Guide to Meditation, written by Anna Patrick at MindBodyGreen. How often do you hear yourself saying "I'm too busy for ____"? This is an anthem of Western culture; priorities shift/fade when we're in this constant momentum. The Zen saying suggests: "You should sit in meditation for 20 minutes a day, unless you’re too busy. Then you should sit for an hour. All Zen teachings are ideal, in theory, but for many of us these "shoulds" seem unattainable. Here's 6 suggestions to help you start making the shift into daily quietness. 1. Meditate first thing in the morning. One of the best times to meditate is first thing in the morning, before you're carried along with the day’s current. Once you've done your morning ritual, whether it’s having a cup of tea or reading the paper, sit down for a 10 to 15 minute meditation. Make meditation a part of your morning routine, a quiet time for you to center yourself. This way, you'll take your centered and peaceful nature with you throughout your day, which preemptively curbs any stress that may creep in later. 2. Set a meditation timer. To avoid all of the white noise of the Ego mind trying to end your practice prematurely and keep you from finding a place of peace, set a meditation timer on your phone. Sit in confidence that your phone will alert you when your practice is done, and do not open your eyes until that alarm sounds. Whether you are sitting for 10 minutes or an hour, setting a meditation timer is a great way to cut time out of the equation and make your meditation more accessible. 3. Set a meditation alarm. Once you have programmed a meditation timer, set a meditation alarm. Let this phone alarm be your “call to prayer,” in a sense, calling you to your meditation. Set it for a time when you will be free to meditate. This will eliminate the Busy Person’s forgetfulness and excuses to avoid meditating. 4. During meditation, allow thoughts to come in at first, and then float away. One pitfall the Busy Person faces in the beginning of a meditation session is succumbing to the distractions of his/her own thoughts: the incessant stream of consciousness where your mind evaluates the actions of the day, or the actions yet to be performed. One’s first instinct may be to silence these thoughts, but in reality that only postpones the thoughts. Instead, allow yourself a few minutes, or however long it takes, for the thoughts to subside naturally. Sometimes it may take the entire meditation, and that’s OK. In the essence of Zen meditation, listen to what your body needs. Next, observe thoughts from an outside perspective, as if you are on a park bench watching cars go by. The cars are your thoughts, and after awhile, you may find that they will subside naturally. 5. During meditation, return to your breath if your to-do list rears its ugly head. If you find yourself following a train of thought, always return to your breath. It’s an easy way to get back into your rhythm. 6. Be patient with yourself. Show yourself some love and understanding as you navigate the waters of meditation. It can be a difficult practice, and you may at times feel lost – but you may at times also find your self. Our Foundation Friday series delves into the basics of yoga—looking at its postures (asana), breath (pranayama), philosophy, and all the other essentials—giving you the foundations upon which to build a solid practice. 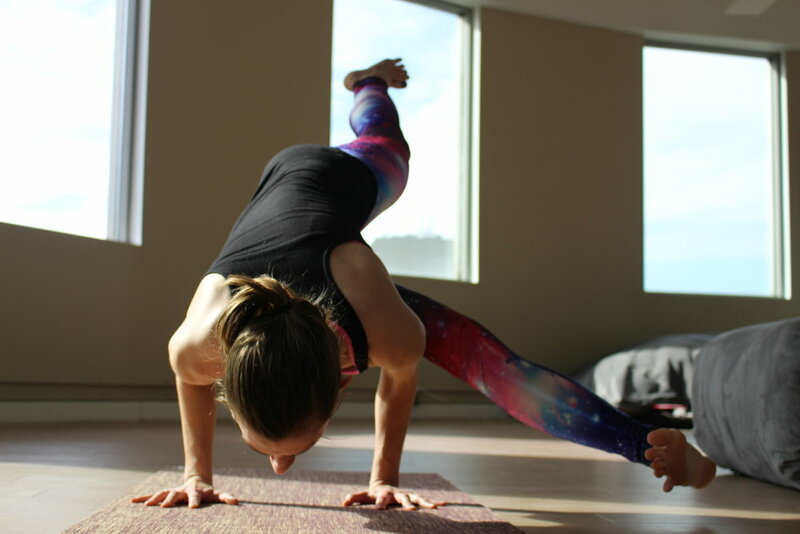 Today's post comes from Jenn Poholka, a Yogalifer who loves to fly! Eka Pada Koundinyanasana, or Pose Dedicated to the Sage Koundinya, takes control of the breath, core strength, openness in the side body and trust in yourself. 1) Start to draw awareness to your breath. Inhale and exhale through your nose and match the length of your inhales to the length of your exhales. You can even awaken your Ujjayi Breath, still breathing through your nose, but with every exhale you will constrict the back of your throat. 2) It's important to warm up the core with poses like Navasana (boat pose) also laying on your back and doing leg raises and yogi bicycle to fire up your stomach muscles. 3) You can open the side body and strengthen your inner thighs with a lunge twist. From down dog step your right foot forward in between your hands. Shift your shoulders over your hips and joint your palms together at heart centre. With your inhale lengthen your spine, with your exhale hook your left elbow to the outside edge of your right leg. After a few breaths return to down dog and repeat the other side. Now to get into the pose! 1) From down dog use your inhale to raise your right leg to the sky, with your exhale draw your right knee to your left tricep ( the outer edge of your arm). 3) Inhale to shift your weight forward and extend your right leg, with your exhale hug your left thighbone to your hip socket and float your left toes off of the floor. 4) You can also get into the pose from your lunge twist. Just like the warm up, after you hook your left elbow to your leg disconnect your hands and place them shoulder width apart. Feel your spine grow with your inhale and use your exhale to lower your hands on the floor. Be sure to keep your elbows bent (Chatarunga). Root the inner edges of your hands and pads of your fingers and shift your weight forward as you feel your lower belly hug in and up float your left toes off of your mat. *Believe in yourself and know that a few falls are always a great way to learn. *If you feel scared about falling forward or on your face you can put a pillow in front of you! 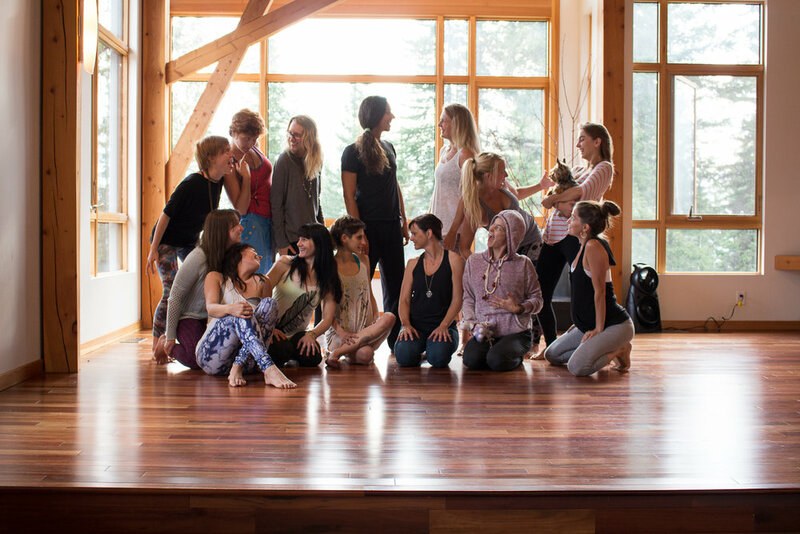 The 2014 Gaiatri Kula at their retreat in Golden, BC. We are well into 2015 and the studios are bursting with yogis! We are so thrilled to see all your faces, new and familiar, and build new connections within our community. This week we are focusing on just that: community bonds. "Kula" is a sanskrit word meaning community, which stems from the term "Kula Siddhi" - the idea that the entire universe is connected in every aspect of the diversity of creation. These connections allow the universe to keep growing and expanding. Yoga is a personal experience, yet practicing alongside your community of fellow yogis allows for an energy exchange, a symbiotic uplifting that unites the entire room. Everyone in the room is within their own intention, which radiates out to fill the space and heighten the power. This community that we build every time we step to our mats is a kula. So get excited about your kula, and know that we're all in this self-study journey alongside one another. Smile at each other, ask questions and listen. The more we build smaller kulas within the walls of our spaces, the more we radiate that love back into the world! Namaste. See you on our mats, in the hallways, and in our communities. Welcome to 2015! In this time of transition, renewal and reflection, what is your intention for this year? Maybe you're inviting a theme to your life, or perhaps you've assembled a specific list of ways to live and the things to do to get you there. This concept of shaping and committing to a goal is called sādhanā, quite literally defined as "a means of accomplishing something". In yogic philosophy this is generally a spiritual exertion or focus to achieve your said goal, but the theme can arch into many other accomplishments you want to create in your life. Traditionally, the chosen sādhanā is guided by a guru until the practitioner steps into the rhythm autonomously. Who may you need to seek out to ensure your path is set up, or are your goals already so apparent that you can step forward with confidence? Sādhanā is a discipline undertaken in the pursuit of a goal. Abhyāsa is repeated practice performed with observation and reflection. Kriyā, or action, also implies perfect execution with study and investigation. Therefore, sādhanā, abhyāsa, and kriyā all mean one and the same thing. A sādhaka, or practitioner, is one who skillfully applies...mind and intelligence in practice towards a spiritual goal. "In finding the answers to these questions, you will find your way from the realm of finite ego to the realm of higher consciousness, and you will have the experience of total relaxation into mental happiness and contentment." Find the balance of fierce grace with this essential yogic breath. Ujjayi breath is a pranayama technique that allows you to focus and calm the mind. Often coupled with asana, this breath will guide you deeper into poses, steady your intention and allow you to experience your yoga more fully. In your practice, breath is regarded as the teacher; how you move and where you go is paralleled with the rhythm of your breath. Ujjayi breath is strong, fierce, warming - your pranayamic partner to bring you out of fear, anxiety, or judgement. Just as the intensity of your practice fluctuates, so does your breath. You may choose to use this fiery breath throughout your practice, or switch it up with a more gentle nostril breath like sama vritti to adjust the tone of the moment. Ujjayi breath is done through the nose, travelling down deep into the belly and filling up the rib cage. A hissing or "wave-like" sound is created upon exhale through the constriction of the back of the throat. Breath is slowed by the diaphragm and by this constriction, resulting in an audible exhale. The length of inhale and exhale is even and smooth, and intensity of this breath may increase in conjunction with the intensity of asana. You may liken Ujjayi breathing to fogging up a mirror with your breath with the mouth closed. Again, intensity can fluctuate but the principle of restricting the back of the throat is key. Our Foundation Friday series delves into the basics of yoga—looking at its postures (asana), breath (pranayama), philosophy, and all the other essentials—giving you the foundations upon which to build a solid practice. Today we're sharing tips on prenatal yoga. Our post today comes from Emily NcNicoll (who you may remember from Monday), our prenatal-passionate yogalifer. This piece was written specifically for teachers and is equally important for an expecting yogi to understand the limits of her body and practice. Although it can be intimidating to have a pregnant lady walk into your class, it is a wonderful chance to serve a woman that is going through a lot of change and would likely appreciate your support. Remember that knowledge is power and keeping educated with simple guidelines can make a big difference to your teaching experience and the way in which you serve your community. Just like asking people about injuries, being informed about a pregnant woman in class is important. A simple “If you’re pregnant, come have a chat with me before class starts” is a good way to let a woman know she is seen and cared for by her teacher. Also, talking with front desk staff at the studio can be a good way to stay informed. Knowing the basic do’s and don’ts about practicing yoga while pregnant is a great way to build confidence as a teacher and a great service to all potential students. Pregnant women produce high levels of a hormone called Relaxin. One of the roles that this hormone has is allowing for the ligaments around the pelvis to relax therefore allowing the bones of the pelvis to shift for childbirth. In terms of any exercise that involves stretching, it is very important for a pregnant woman to stay away from acute sensation in her joints (i.e knees) as Relaxin can make her ligaments and tendons more susceptible to injuries than a person who is not pregnant. My advice to the woman is to engage firm foundation of hands and feet (hasta and pada bhanda,) avoid hyperextension, and ease away from any painful sensations. Pregnancy tends to induce heat in the body as it is literally working to grow life. With this in mind, encouraging woman to ask the teacher to cool down the room when she is feeling too hot is really important. A cooler room is often a relief to a pregnant woman as her internal temperature is high. I often bring a sweater when I teach prenatal so all the woman can remain comfortable, myself included! Just like paying close attention to painful sensations and her own temperature, encouraging a pregnant woman to set her own pace and listen to her body is important. Teaching modified postures first and then offering more challenging variations is a great way to allow a woman to empower herself with choice. One day she meets her mat she may be up for a lot of physical challenge and the next day it could be different. This is why as a teacher being educated in modifications and prop use is really important. Always talk to the teacher before class to inform them of the pregnancy. No hot or warm yoga. As explained above, a pregnant womans body temperature is on the rise. It is important not to aggravate this further. Also, pregnancy is thought to be a good time to introvert and build the bodies energy. Hot yoga can easily exhaust energy reserves which are needed for childbirth and being a mother. This is another great reason to encourage a woman to go at her own pace as only she will truly know what she’s feeling and her own personal needs. No core yoga. A little bit of core engagement is encouraged (like 20-25% of her capacity) as it helps to tone and strengthen the pelvic floor and support her spine and hips. A core yoga class would not be recommended. No arm balances. Unless a woman already has a strong inversions practice, staying away from arm balances is a safe bet. The risk of her falling out of the posture must be considered. Keeping her and her child safe is obviously important. Likewise when doing one legged balancing postures. Pregnant woman should be encouraged to use a wall when getting into and out of the poses with the option to play with taking hands off the wall. Some women find their balance to be way different when they are pregnant and the wall is there for her safety. No deep twists. Gentle twists are a great way to lengthen and restore the spine but deeper twists with core engagement are a great way to encourage elimination. Keeping a soft lower belly and lots of room for the uterus is important. The feet in forward folds should be a little wider than hip distance apart. In the beginning stages of pregnancy it will leave space for the womb and with in the later stages it will be the best way to accommodate the babies growth. In the second and third trimester laying flat on her back is not recommended. The baby can put pressure on the mothers aorta (a main artery) and cause loss of blood flow to the brain and heart. Modifying reclined postures like savasana with bolsters is a good way to keep her more upright. You can also recommend resting on the LEFT side with a bolster between the thighs and one under her head. The left side is important due to the position of the aorta. Know your oils! Some essential oils can cause uterine contractions. If you’re using oils in class be aware of the contraindications and when in doubt, don’t use them. If you're interested in prenatal classes at Yogalife Studios, please get in touch with us at info@yogalifestudios.ca or by calling either of the studios. Our next round of prenatal yoga classes start December 4th at Yogalife Studios South with Sara Cueva and December 5th at Yogalife Studios North with Emily McNicoll. Our Foundation Friday series delves into the basics of yoga—looking at its postures (asana), breath (pranayama), philosophy, and all the other essentials—giving you the foundations upon which to build a solid practice. Today we are exploring 'legs up the wall' pose, or Viparita Karani. One of the most gentle and nurturing ways to care for yourself is through restorative yoga, a passive form of practice that invites the use of props alongside long-held postures to facilitate subtle opening and overall relaxation of the body. In the case of viparita karani, the wall is your prop! This pose is a passive inversion and holds the same benefits of many other active poses in the same category. Our Foundation Friday series delves into the basics of yoga—looking at its postures (asana), breath (pranayama), philosophy, and all the other essentials—giving you the foundations upon which to build a solid practice. Today we are sharing a teaching from Pantanjali's classic yoga sutras, Swadhyaya or self-study. Swadhyaya is one of the five Niyamas (daily observances) presented in Patanjali’s Yoga Sutras. These practices are the foundation of a yogic life; the system of the Niyamas lend to simplifying clutter and observing/attaining stillness. Pantanjali teaches that these practices progress your spiritual life on the basis that everything you need is inward. What one looks for is already there. These 5 observances are a system meant to work in harmony rather than isolation. Patanjali also notes that this Niyama involves the study of the ancient scriptures pertaining to Yoga (The Vedas, Upanishads, Bhagavad Gita, and The Yoga Sutras of Patanjali). These teachings are used to assist us in engaging in life spiritually through self-inquiry. As we meditate and contemplate our own life's lessons - our thoughts, emotions, reactions - we begin to learn about our true Self. Reflecting on our own flaws, patterns and stories rather than those of others gives us the opportunity to grow, allowing our mistakes to become lessons. In your life and within your yoga practice, look at yourself with the same discernment you use with others. As if you are watching your life on film, notice what happens with your sensations, emotions, feelings, thoughts and breath; feel empowered through your process of self-study. Saucha is cleanliness which involves keeping your body clean inside and out. This includes eating the right food, decluttering your environment, communicating with clean and clear words as well as purification of the mind. Santosha or contentment is the practice of being content with having enough in life. Tapas is the practice of austerity or self discipline. This is a practice for simplifying your life, removing all the unnecessary things that do not serve you. It is a way of reflecting the external into the internal to refine your needs. The interference of thoughts and emotions can prevent us from seeing our inner stillness. The observance of Self allows you freedom to step into your highest form through truth and discernment. This practice allows us to surrender to the divine or higher reality. Yoga is a spiritual practice but not a religion - the science and vehicle that enables us to understand our own beliefs better. Our Foundation Friday series delves into the basics of yoga—looking at its postures (asana), breath (pranayama), philosophy, and all the other essentials—giving you the foundations upon which to build a solid practice. Today we are highlighting Uttanasana, or standing forward fold. Ud (उद्; ud) = prefix for verbs or nouns, indicating superiority in location, rank, power, intensity Tana (तान; tāna) = "stretched" Uttana (उत्तान; uttāna) = "intense stretch" or "straight" or "stretched" Asana (आसन; āsana) meaning "posture" or "seat"
Uttanasana is an active time-out; your legs release, your feet root and ground you, your head is below your heart, and your spine releases. Taking time here allows your other postures to integrate and connects you to the present moment. With a variety of ways to execute uttanasana, you can tailor your experience in this asana to suit your intention. You may choose to dangle and sway, releasing tension from your entire back body, or you may choose a variation including a grip on the toes or hands under the feet with a more active core, spine and legs. Regardless, uttanasana allows you to hang your heart close to your body, a shape that offers inner reflection and the opportunity to create self-love. As our postures are medicine, this one bows you into your Self, creating a reverent pause to fall deeper in love. 2. With your hands on your hips, exhale and fold forward, drawing your navel to your spine slightly to create more space from which to bend. 3. Continue to root down through the 4 corners of your feet and draw energy up the inner seam of your legs into your pelvic floor and core. Allow a slight bend in your knee if needed to release any hyper-extension. Lift your sit bones to stretch your hamstrings and take your inner thighs up and back to release your sacrum. 4. Release any tension from your neck and allow the weight of your crown to draw you deeper into the stretch. 5. You may choose to grab for opposite elbows, wrap a mudra around your big toes, walk your palms under your feet or place your hands to the sides or backs of your legs. Follow the pattern of inhale to lengthen and exhale to deepen to continue to surrender in this pose. 6. You may hold uttanasana for 30 seconds to over a minute, or perhaps as long as you need. To come out of the pose, bring your hands back to your hips and rotate up from the joint until you are standing strong and tall. Let the information of the pose land in you as you breathe and observe. This post is yet another instalment in our Foundation Friday series - tidbits of information to deepen your practice. This month we are focusing on falling deeper; exploring the practices that allow you to shine from the inside out. We will focus on a variety of self-love and self-care practices to get you falling! Earlier this week we shared yoga poses to get you glowing, focusing on postures that stimulated the lungs and digestive systems to make your skin radiate. Today we're sharing something even more simple and incredibly effective: dry skin brushing. This simple wellness technique is quick, inexpensive, and helps to cleanse your body inside and out. October: Bold, earthen colours float amongst the the fall foliage. Leaves whiz atop the earth in a dizzying haze. Us Edmontonians savour the all-too-short time to run about in our fall scarves and jackets, sipping warming teas, and feasting on the foods of the fall harvest (like pumpkin-spiced everything) before the heavy winter sets in. Routines that fell away during summer return to their regular rate, and maybe you're finding yourself craving some time in the hot room again. This month, we're focusing on falling deeper into practice—we will be sharing our favourite self-healing practices and ways to glow from the inside out. Come along with us on the blog and in our studios as we move through a journey of self-love and healing! A huge part of self-love is physically telling yourself how and why you love you. Affirmations are these personal statements; they encompass anything you need to plant within you at that moment. The result is an increased positive self-perception that can condition your subconscious mind to get on board with your needs and goals. Just as you can create a damaging inner effect by constantly negative self-talking and keeping ourselves down, you can reverse the pattern and get on your own team through dedication to your positive affirmations. Shifting your thoughts from negative to positive can truly shift your life. 1. Choose your affirmations for YOU Allowing your script to come from a place of what YOU need is important. Think about your goals, needs, desires, and let that guide the words. 2. Write down what you love about yourself It can be a daunting task to compliment yourself, but it is a huge part of letting the self-love pour in. Sit with a pen and paper and record everything you love about you. This will help you gain the confidence you need to let your affirmations land and work. Use present tense for this writing: I am beautiful. I am strong. I am worthy. 3. Replace the negative Think about all the negative scripts you rattle off in your head - this may be a written physical list too. For each one, find its positive counterpart. Use this positive list to counteract the negative. Be vigilant in changing your language to yourself. 4. Prioritize As you go through this process and start creating your lists and really looking at your language, you may find there is a lot to sift through. Rather than feeling overwhelmed, prioritize what your most immediate goals and needs are and then focus on those. The other things may just fall into place! Once you see improvements in one area you can move onto the next. 5. Write it down You've had lots of practice writing things out by now! Continue that with your chosen affirmations. Choose to create these as "I can" and "I will" statements. See yourself achieving your goals! 6. Repetition is key Find yourself coming to your affirmations multiple times a day through different mediums. Writing them in your journal, on your bathroom mirror, the fridge, the front door, on your yoga mat, in your car... keep letting the positive energy of your words take you into a deeper self-love. We'd love to hear your experience with self-love, goal-setting and affirmations. Connect with us on our Facebook page or get the conversation going around the studio next time you're in. We love this stuff and we love YOU! This post is yet another instalment in a series that delves into the basics of yoga—looking at its postures (asana), breath (pranayama), philosophy, and all the other essentials—giving you the foundations upon which to build a solid practice. Today's posture is another great addition to our Grounding Series. Don't you just love it when your teacher says those words, offering you the chance to retreat inside, to turn inwards, to shut off all external noise and simply breathe? Child's pose, or Balasana, is frequently offered as a break within sequences, a time to re-establish steady breath, calm the heart rate, or return to intention if we've gravitated away from what we've set out to do. Why is child's pose so grounding and calming? First of all, the shape of the spine in a child's pose mimics the shape of the spine in a fetal position—and our time in utero was, for most of us, the most stress-free, comforting, and grounded environment we've ever known. It's a gentle reminder to our bodies, and then our minds, to return to that calm, quiet state. Secondly, all forward folds are—in their physical nature—calming and quieting as our bodies are literally turning in towards themselves. The anatomical action of folding our bellies, chests, and faces into our legs—or in this case, the floor—seals us away from whatever is going on externally so we can only look at ourselves. Further, the action of resting the forehead down on something (the earth, stacked fists, a block) gently stimulates the vagus nerve. The vagus nerve helps to regulate the parasympathetic nervous system (the part that allows us to rest and relax), and in doing so it naturally lowers our heart rate, blood pressure, lessens tension and the stress hormone cortisol. That's why child's pose is also an excellent bed-time posture! From Downward Facing Dog, lower your knees down, about mat-distance apart. Touch your toes together, and rest your seat back on your heels. Fold your torso forward. Let your belly rest in between your thighs. Extend your arms forward, palms facing down. Find someplace for your forehead to rest—if the ground is not available, you can use a block, a folded blanket, or even stack your palms or your fists. *For a more traditional Balasana, work with your legs parallel to each other (hip-distance apart), and extend your arms back, alongside your body with your palms facing up. We hope this helps you better understand balasana, or child's pose. Please feel free to comment on our Facebook with any further questions. And let us know if you have something you would like to see featured in Foundation Friday! This post is an instalment in a series that delves into the basics of yoga—looking at its postures (asana), breath (pranayama), philosophy, and all the other essentials—giving you the foundations upon which to build a solid practice. Today’s focus will be on Tadasana, or Mountain Pose. This month we're sharing our favourite grounding poses and, as the name suggests, Mountain Pose creates stable roots from which to rise. Depending on the style of yoga you are practicing, you may also hear this pose referred to as Samasthitiḥ. Essentially, this is your center. Tadasana creates a feeling of union in your body; a sense of connection to the earth and the sky. Just as the majestic mountains boast height and width to secure their stature to the planet, tadasana is your foundation to feel grounded. Although tadasana is a basic pose, it is the blueprint for many other poses (you could almost say all!). You can find this anatomical position of the body in many other poses and relate how that center stability is present in other asanas. It is an important pose to allow your body to receive and integrate the information and benefits from your practice. Tadasana allows you to recalibrate and prepare for the next posture; stability and grounding are the foundations of this pose. 1. Start standing with your feet hip distance or wider - make sure this is a comfortable, stable stance. 2. Check in for foot/ankle alignment - the base of the second toe lines up with the center of your ankle. You may choose to sway gently here, finding the balance in the souls of your feet to ground down with. 3. Engage pada bandha, drawing energy up the inner line of your leg to stabilize your knees and charge your thighs all the way up to your pelvic floor, finding a subtle connection to your core. 4. Supinate (rotate outwards) your arms to create "anatomical position". Allow your thumbs to open up outward, rolling your arms open and creating space in your collarbones and shoulders as your scapulae gently draw onto your back. Watch that your ribs don't jut forward here - use core stability to keep the spine growing tall right through your crown. 5. Relax your shoulders and draw attention to your back body - feel the base of your skull stack over the back of your heart and sacrum. This back body awareness allows you to feel genuinely stacked and supported: rooted from your feet, all the way into your lower back, shoulders, and head. 6. Balance the crown of your head directly over the center of your pelvis, with the underside of your chin parallel to the floor, throat soft. Soften your eyes. 7. Tadasana is generally the starting point of all standing postures, although it is an important posture in itself. Stay in the pose for at least 30 seconds to a minute, scanning the alignment through your entire body and focusing on your breath. We hope this helps you better understand this essential posture, tadasana. Please feel free to comment on our Facebook with any further questions. And let us know if you have something you would like to see featured in Foundation Friday! This post is an instalment in a series that delves into the basics of yoga—looking at its postures (asana), breath (pranayama), philosophy, and all the other essentials—giving you the foundations upon which to build a solid practice. Today's focus will be on Malasana, or Garland Pose. In conjunction with our monthly theme, Malasana is one of the ultimate grounding yoga postures. The rooting through the feet, the closeness of the pelvis to the earth, and the general feeling of heaviness and surrendering to the weight of gravity in this posture all encourage a downward flow of energy. Malasana's energetic qualities are calming, soothing, and quieting for the busy mind, as this asana activates a flow of prana down through the body, towards the ultimate source of grounding—the earth. Many Eastern cultures are accustomed to sitting on the floor for meals and meetings, or squatting comfortably as they go about their daily activities— whereas In our Western world, we spend so much of our lives seated in chairs, car seats, or on couches. We lose the softness and suppleness of our hips, calves, and ankles, and the strength of our low back, thighs, and core. Physically and energetically, malasana helps to counteract these losses. Start standing with your feet about mat-distance apart. Turn your toes slightly outwards. Lower your hips in between your legs. Keep your heels on the floor if you can, or support them with a folded mat or towel. You might even try this posture with a prop—like a block, or bolster under your seat. Draw your hands into anjali mudra (prayer position) and slide your shoulders back. Press your outer elbows into your inner thighs, and vice versa. If this is too much, keep both of your hands on the floor in front of you for support. Lengthen your tailbone down towards the earth—like gravity is pulling it lower—but lengthen the crown of your head higher to elongate your spine. Broaden the front of your chest. Once you're in malasana, try closing your eyes. See if you can hold the posture for a minute, or maybe even longer. Perhaps you can feel the downward flow of energy moving through your body. Notice, when you come out, if you feel a little more calm, or connected with Mama Earth. If you need some release, a forward fold is a really sweet counterpose. We hope this helps you better malasana, or garland pose. Please feel free to comment on our Facebook with any further questions. And let us know if you have something you would like to see featured in Foundation Friday! A reclined twist is a wonderful, gentle way to nourish, massage and lengthen by inviting rotation to the thoracic and cervical spine. Fitting with foundation, today we're taking a look at the spine: the literal backbone of life! Spine alignment comes into play with each and every asana and yoga is an amazing practice for spine health and rehabilitation. At the most basic level, the spine is comprised (normally) of 33 vertebrae - 24 articulated and separated from each other by intervertebral discs, the 9 lower vertebrae fused together (5 in the sacrum and 4 in the coccyx or tailbone). A healthy spine has 4 curves to it - a lordodic curve in the cervical and lumbar spine and a kyphotic curve in the thoracic and sacral spine - which creates a balance to support two main functions of the skeletal system: stability and mobility. In yoga we refer to the rotation of the spine as a twist, often used throughout a sequence at varying levels of intensity. Twists may be active or passive, supported or strengthening. In general, they are all meant to lengthen and nourish the spine. It is important to remember to twist from your thoracic spine and allow the twist to finish in your cervical spine for full rotation. As always, it is also important to listen to your body and especially not overdo these poses. Let your breath guide you into depth. Cherish this masterpiece within your body! As you press into the earth, hollow your tummy and round your spine, flexion is created by deepening the thoracic spine's natural kyphosis. The natural curve of the cervical and lumbar regions allow the flexion to continue in the neck and lower back. Spinal extension is created by tilting your sit bones and heart upwards, rolling your shoulders back and lifting through your collarbones. This hammock shape provides the opposite curve that the thoracic spine is normally resting in and range of motion may be limited here. It is important to concentrate on lengthening your energy and breath through the entire spine to free up tension from the lumbar region. As the legs and pelvis root into the earth, the spine lengthens up and over to the side in a C-curve to create lateral flexion. Be mindful of space in this pose, especially around the shoulders. By keeping soft and your upper back and neck and connected in your core, the spine will be supported to move in this manner. The most freedom will be felt in the cervical and lumbar spinal curves. "The yogi will tell you that you feel and look as young as your spine is elastic." This post is an instalment in a series that delves into the basics of yoga—looking at its postures (asana), breath (pranayama), philosophy, and all the other essentials—giving you the foundations upon which to build a solid practice. Today's focus is a little bit different—we're looking at how yoga can be beneficial in sleep. Because what could be more foundational for your yoga practice, your day—your life!—than a good night's rest?! We all know the symptoms—dark half-moons under the eyes, lion-sized yawns, a lowered level level of alertness. If you've ever spent a night—or a string of them—tossing and turning, clock-checking, and worrying yourself awake, you're certainly not alone. According to the CHFA, one in seven Canadians have insomnia, or trouble falling asleep or staying asleep. And sleep deprivation is one of the leading causes of stress among American adults. As anyone who's spent a night sleepless in bed knows, counting sheep may be a somewhat entertaining attempt to lull yourself into a sweet slumber—but it's not always the most effective. Bed-time yoga has been proven as an effective method of lessening the time it takes to fall asleep, and lengthening the time it takes to stay asleep—so much so, that even the U.S. Department of Defense has been using a yoga nidra derivative to help treat its soldiers sufferrering from Post-Traumatic Stress Disorder—an ailment that shares similar symptoms with insomnia, like anxiety, or the inability to sleep at night. While sun salutations and vinyasa are not particularly recommended, some gentle, calming yoga postures—done next to, or even right in your bed may help to soothe your mind and body into a sleep-state. Check out our top five yoga postures to help with sleep, below. You'll notice that this list includes plenty of forward folds—forward folds, or extension promote a turning inwards, helping to rest and soothe the brain. Forward folds stimulate a cooling sensation in the body, and also help the digestive system to assimilate whatever hasn't yet been digested, whether physically or metaphorically. Start from all fours, or a Tabletop position with your wrists outer-shoulder distance apart and your knees under your hips. Tuck your toes under, and press your hips skyward. You might need to bend one knee, and then the other to find some space in your back body to make this posture more comfortable. Bend both knees, and send your belly back towards your thighs. Lengthen your ears away from your shoulders. Sit up with your legs extended in front of you. Remove the flesh from underneath your sit bones by manually sliding it out from underneath your seat. Extend your heart forward towards your legs, and then fold forward. Relax your arms beside your feet or legs and let your head be heavy. Use the physical feeling of turning inward to help guide your mind inward as well—turning your thoughts off from the day behind or ahead of you, and instead focusing on calm breath and the physical sensations you feel inside your body. Bend your knees, scoot your hips slightly over to one side, and then lower your legs to the opposite side of your hips. This should help your hips to stack over top of each other. Turn your head opposite your legs if it's okay for your neck. If your knees are lifted uncomfortably away from the floor or your bed, you might support them with a blanket or pillow (bonus since they're so close!). Again, breathe deeply into your belly to invite a gentle compression into your internal organs, facilitating digestion both physically and metaphorically—helping yourself to integrate the happenings of your day so that you can rest and prepare yourself for the next. This posture may also help to alleviate any back and neck discomfort that prevents you from falling asleep. Fold your torso forward between your legs and allow your forehead to rest, on either your bed, or stacked palms or fists. Take slow, deep belly breaths. If you like, you can massage your brow by gently rocking your head from side to side. Work through your body slowly, one piece at a time—draw all of your awareness to that part, starting at your feet. Notice the way your feet feel, and if there is any tension or muscular engagement in your toes, the balls of your feet, your arches, your heels, your ankles. Consciously relax that part of your body, using your long, drawn-out exhales to soften. 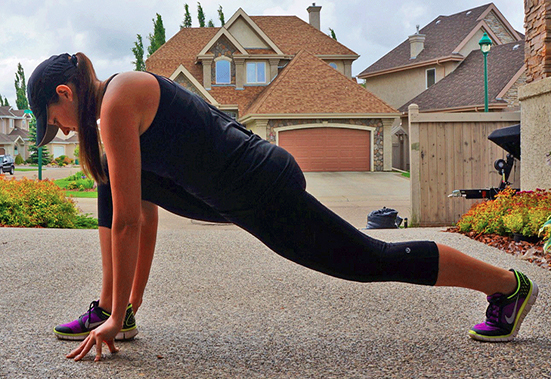 Work your way up through your legs, your arms, your torso, and your head. Once you've covered all of the areas of your body—if you've made it through all of them without dozing off!—notice the way you feel now, and see if you can tell your mind to relax in the same way you have your body. Use these postures alongside a deepened, calm breath. If thoughts are giving you anxiety, or preventing you from falling into a sleepy state, you can try writing them down in a bed-side journal, or try to let them pass by you without getting attached. If these postures aren't enough, you might try making some small lifestyle changes—like avoiding caffeine after lunch, turning all your screens off at least an hour before bed, or settling into a nighttime ritual to help tell your body it's time to rest. Let us know what's helped, and what hasn't in your journey to easy rest. Sweet dreams, yogis! This post is an instalment in a series that delves into the basics of yoga—looking at its postures (asana), breath (pranayama), philosophy, and all the other essentials—giving you the foundations upon which to build a solid practice. Today's focus will be on Anjaneyasana, or Crescent Lunge Pose. Anjaneyasana, or Crescent Lunge Pose is a posture you'll find in nearly every yoga class. You might find yourself in an Anjaneyasana variation with your back knee lifted or lowered, toes tucked under or not, perhaps in a slight back bend, or with your arms reaching back like you're a runner about to leap off your starting block. Lunges strengthen and stretch the feet, legs, hips, core, back, and even the shoulders and arms—this posture gets your whole body involved! From Adho Mukha Svanasana (Downward Facing Dog), step your right foot up in between your hands. Or, from Tadasana (Mountain Pose), bend your knees and take a long step back with your left leg. Ensure your legs are hip-distance apart. Lunge into your front leg—bend your front knee to a 90-degree angle, while ensuring your stance is long enough that your front ankle lines up directly underneath your knee. Choose to lower your back knee (low lunge), or keep it lifted (high lunge). *If lowering your back knee bothers your knee joint, you can place a foam composite block underneath that knee, or fold your mat over to offer the joint extra padding. Press your front foot down strongly to lift your torso so that it's vertical, stacking your shoulders over your hips. Squeeze your inner thighs towards each other to press your right hip back and your left hip forward, so your hips are square. Root your tailbone, but lengthen up throughout your spine to the crown of your head. Reach your arms skyward, slide your shoulders back and down your spine, and fan your fingers out wide. Try out the different variations of crescent lunge to see what feels best in your body—maybe you'd like to work from a high lunge, reaching your arms back alongside your body and interlacing your fingers to expand across your chest. Or perhaps you'd prefer to find a deeper stretch into your psoas from a low lunge, reaching your fingertips to the ceiling and opening your heart skywards. Or, if you're practicing at home, try using Anjayeasana as a preparatory pose for the Warrior Series. We hope this helps you better anjaneyasana, or crescent lunge pose. Please feel free to comment on our Facebook with any further questions. And let us know if you have something you would like to see featured in Foundation Friday! This post is an instalment in a series that delves into the basics of yoga—looking at its postures (asana), breath (pranayama), philosophy, and all the other essentials—giving you the foundations upon which to build a solid practice. This post focuses on one of the "bandhas", or "locks"—in what might be our most literal "Foundation" Friday yet! First off—what is a bandha? The sanskrit word "bandha" translates to lock, seal, or closure. During asana (postural) or pranayama (breath work) practice, bandhas help to energetically "lock" in energy and prana (life force), consciously sealing it inside of our bodies so that it can aid us in our practice. There are three main internal bandhas, one "mother" bandha, and two stabilizing, grounding bandhas—pada bandha, as we'll look at today, is of the stabilizing, foundational variety. What then, is pada bandha? Pada, in sanskrit, means "foot"—so pada bandha, is then a "foot lock," or "foot seal." It is a sealing of your connection—or a rooting—with the earth beneath you. It is a solid foundation upon which you can balance. It's a way to get acquainted with all the tiny, underused muscles in your feet (all twenty of them!). Take a good look at the bottom of your foot.... get really up close and personal! Notice its curvatures, and its raised and recessed areas. Thank them for all the work they do—these feet are what support you, day in and day out! Find the four corners of the sole of one foot—the mound of your big toe and pinky toe, and your inner and outer heel. From standing, place your foot down on an even surface and press each of those four corners down evenly. Pick up all five of your toes and spread them away from your foot and as far apart from each other as you can. While still pressing down through your "four corners," and with your toes lifted, draw, or squeeze the ball of your big toe mound towards your inner heel, and your inner heel towards the mound of your big toe in a way that lifts your arch. Without releasing through the inner edge, do the same with the mound of your pinky toe, and your outer heel. Perhaps you might notice your ankle lift slightly, or feel like you can draw the strength of your feet up your whole leg. 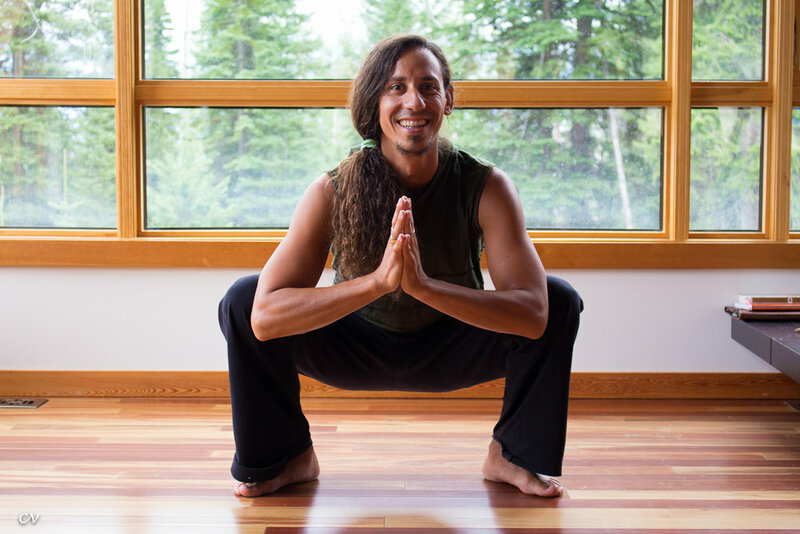 Keeping all of the engagement you found in Step 4, place your toes back down—one at a time if you can—still spread widely, almost as if you had webbed feet, or spacers in between your toes (this is what we like to call "yogi toes!"). Do the same with your other foot. Pada bandha is not only for standing and balancing poses—play with your pada bandha wherever you're at. Notice how activating a lifted foot strengthens your entire leg. If you practice an inversion such as headstand, energize your feet—including your toes—to see how it helps stabilize and balance you further. Even if your legs are outstretched in a seated position, activating pada bandha—pressing out through the mounds of your toes and your heels, while muscularly pulling your toes towards your face—will find you feeling into deep places in your legs that you never knew even existed! We hope this helps you better understand the concept of pada bandha. Please feel free to comment on our Facebook with any further questions. And let us know if you have something you would like to see featured in Foundation Friday!